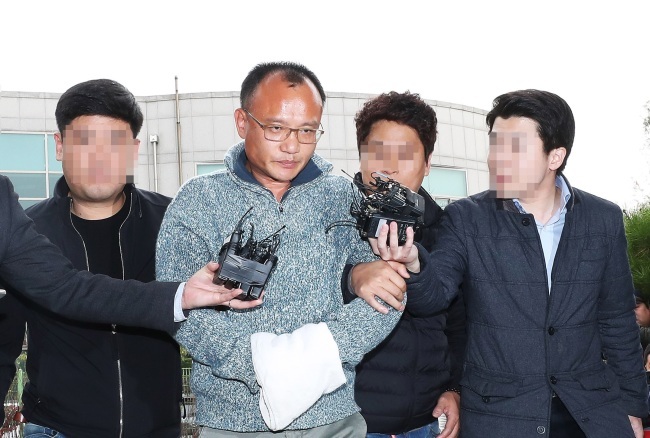 Yang Jin-ho, the CEO of a cloud storage service company, was taken into police custody Wednesday over multiple workplace harassment and abuse allegations by his employees. A police probe was launched after video footage went viral online, appearing to show Yang abusing his employees. In one video, the CEO of WeDisk and robot developer K-Technology is seen killing chickens with a crossbow and aggressively ordering an employee to do the same. Authorities believe the footage was filmed in 2016 during a work-related gathering. In another scene from the footage, Yang appears to be slapping and cursing at an employee in an office. The employee is then apparently forced to kneel down and apologize to Yang. Police plan to seek an arrest warrant for Yang once all the evidence is analyzed. They are also investigating an allegation that he smoked marijuana.